Timber Rattler Tumbleweed Skinner Knife | BUDK.com - Knives & Swords At The Lowest Prices! A great blade that's not cumbersome needs to be compact, but reliable. 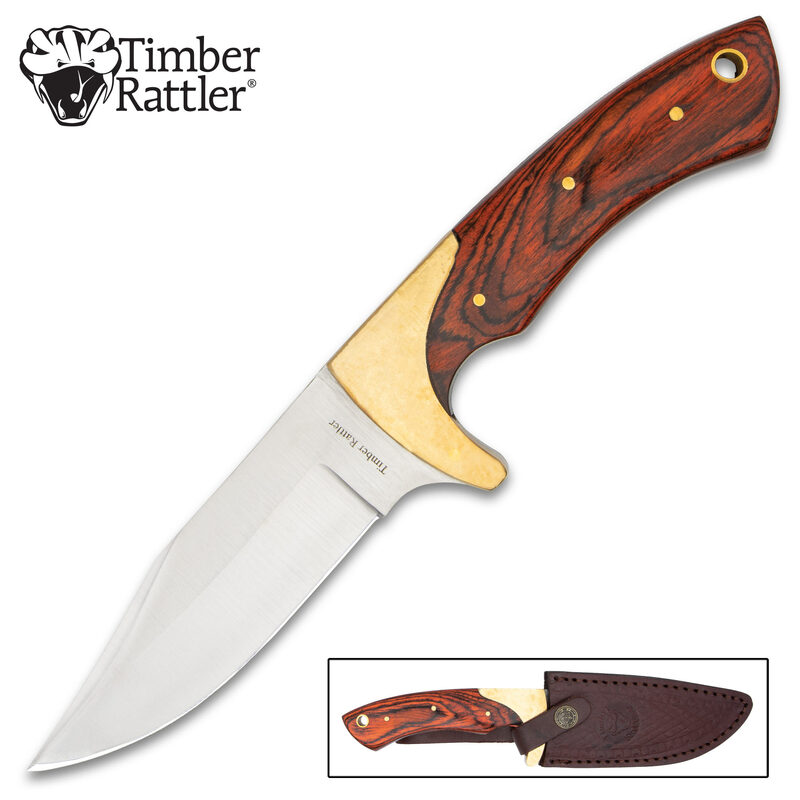 This full-tang Tumbleweed Skinner from Timber Rattler is just that. Its full-tanged, heavy and very well put together. Mine came quite sharp and the bogo sale made it a steal. I may get more of these to give as gifts. This knife is just right for on my belt. Love the lanyard hole too. There is some asymmetric spots where the brass lines up on either side of the tang or I would give it five stars. It came with a nice edge, i have yet to receive a knife from budk that was razor sharp, but it's razor sharp now. Much better than its pic. Great knife. Sharp. High quality. Impressive. This knife is a very good value and I am happy with the purchase. It's actually a substantial knife with a thick full tang blade. Its size and weight are just right for a multitude of uses. The design makes for comfortable handling too. I bought two and both were sharp out of the box and were easily taken to razor sharp. The fit and finish of this knife is not perfect, with some minor asymmetrical aspects to the handle and bolsters. However, that is cosmetic only and doesn't affect the functioning of the knife at all. It's a good work horse knife to have. Overall, I agree with Charlie L. It isn't a Cadillac, but well worth the money paid. A Bruiser of a Knife! This knife is well balanced and substantial. It is the perfect size for all-around outdoor duties, including camping and field dressing large game...it made short work on a whitetail deer. It came from the box with a sharp edge, but I had to go a step beyond and give it a razor-sharp edge. It isn't a Cadillac, but well worth the money paid. This is a superb knife, not too big, not too small...quality product! Really Nice Heavyweight Knife! Thick blade, Full Pound!!! Probably deserves five stars but will have to stand the test of time first!!!!! Great for thick cuts and chopping...Gold Standard Camper!!! !